The Accessory Frame Bracket offers fast, on the ground installation for mounting module level electronics directly to the module frame, saving you time and money. The Accessory Frame Bracket is extremely versatile and works with Quick Mount PV’s Quick Rack rail-free mounting system, as well as rail-based racking systems, ballasted and ground-mounted systems. The Accessory Frame Bracket provides a grounded connection between module level electronics and the module frame. 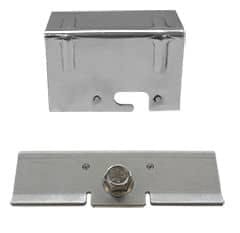 The universal bracket is UL 2703 listed for SolarEdge power optimizers and is compatible with most module frames.